Dryer Duct Service: Begins, Monday 22, and continues through May 8. Waterproofing Planter Walls-Vehicle Ramp: Vegetation and soil have been removed, primer and water-proofing are being applied to the concrete surfaces. Granitex Removal-Vehicle Ramp: Work has begun and is scheduled to continue through May 17. Traffic control will be in place and traffic will be reduced to a single lane so please be attentive and comply with the directions of the officer posted at the bottom and top of the ramp. Elevated Noise-Fire Pump Operation: Required performance testing for rpm calibration during the next three weeks. This additional time will be scheduled for Tuesdays, Thursdays & Fridays between 10:00 AM & 12:00 PM for a run time of approximately 30 minutes. Begins, Monday 22, and continues through Friday, May 17. Please review the schedule, plan accordingly and contact Management if you notice any discrepancies with your windows. 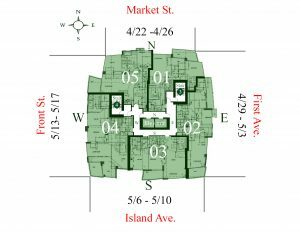 Townhomes & Awnings, May 20-24. Next Board of Directors Meeting. Tuesday, April 30, 6:00 PM, North Tower Lounge. Planter Walls-Street Level: Work is almost completed and the wall surfaces are being painted. When all work has been completed new landscaping will be placed. This service is a critical part of maintaining optimum efficiency when drying and will help prevent water damage in your ceiling do to clogged ducts. Waterproofing Planter Walls-Vehicle Ramp: Work is scheduled to begin on April 8, with workers removing vegetation and soil. 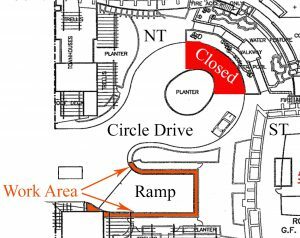 This will require a partial closure of the circle drive (illustrated below) for soil storage, so please exercise caution and awareness. 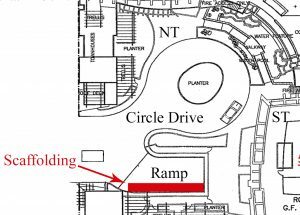 During this evolution of the project, traffic on the ramp should not be affected, however please use caution when entering and exiting the parking garage. New Package Room-North Tower. In an effort to improve services and insure confidentiality of resident information, the parcel room will move to its new location next to the Front Desk, effective 4/15 . Learn about the services of Downtown San Diego’s Clean & Safe Program and help them create the budget for our Marina District! When: Wednesday, February 6th, 5-6 pm. Bring water to drink. Can’t make it to the meeting? Take the online survey to express your priorities.